Princess Marina needs to be married within three days, and there are only two suitors available at such short notice: the gentle, musically-inclined Queen Delphine and the fun-loving flower-crowner Princess Cora. Marina will have to choose one, but can she fall in love in three days? And who will she give her heart to? 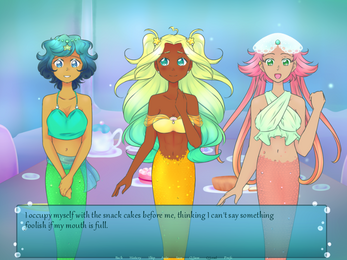 A short visual novel for Yuri Game Jam 2016! Thank god for the poly ending because I loved both of the girls and I want them to be happy at the same time. All the characters are very cute and adorable. this was so cute i loved it. esp then ending where they all end up together thank you for making this so nice and cute!! P.S. Zinka17's idea about a sequel sounds lovely! This is such a sweet story! The artwork is beautiful and the music is really soothing. 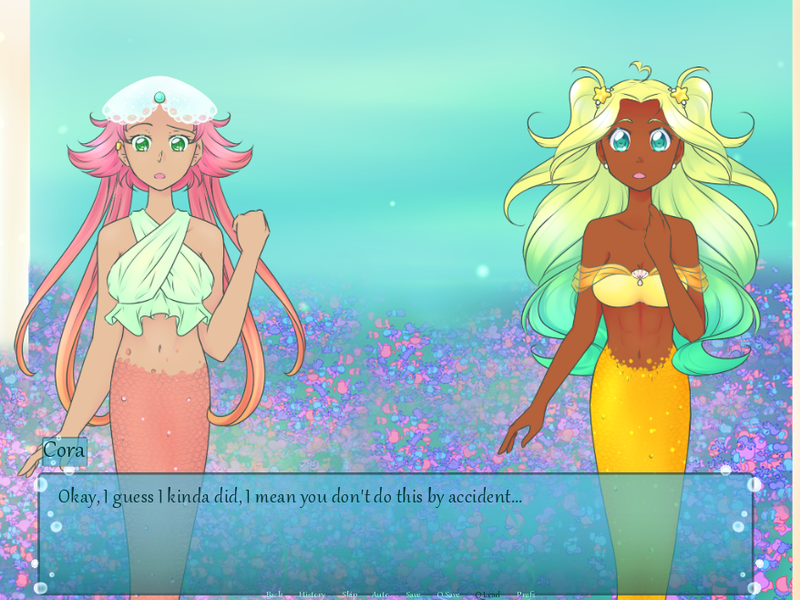 I played all three endings, and my favorite is the one where Marina chooses both Delphine and Cora. 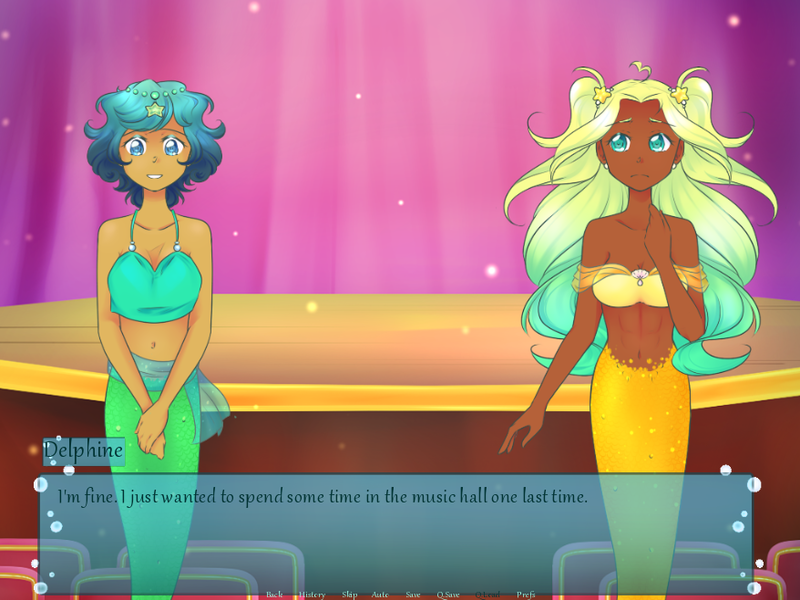 I felt as heartbroken as Marina when thinking about either one of them having to leave, so the version where everyone is happy is the best. One thing I'm very curious about is Marina's mom. We were never shown her wife, which makes me wonder if she's single. But it seems like all mermaids have to get married at a certain age. And if everyone in the queendom is female, how are the mermaids born? I think it would be cool to have a sequel or something that explains more about their world. Thank you very much! Love the article, too! Thanks for playing and streaming! And awww, thanks for getting teary-eyed too - it's great to know you got so emotionally-invested in such a short time! We managed to find the stream video and watched it - we're so glad you enjoyed it! And we also hope you will, in the future, check out our other games/demos. 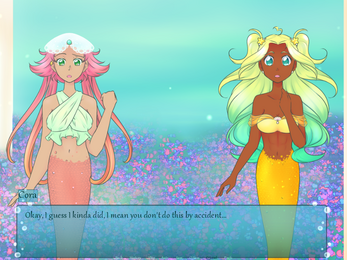 ;) As a side note, there are actually three routes/endings in Oceanic Hearts. Did you manage to find the third one~?